Cape Town Plus Ten: Child Soldiers: What Have We Learned? What Do We Still Need to Know? As part of the follow-up to the Cape Town Principles and Best Practice, UNICEF and NGOs are organized a series of regional workshops to take stock of achievements and shortcomings since 1997. 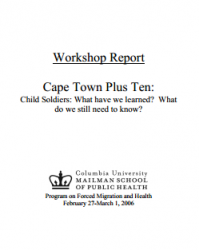 This ‘Cape Town Plus Ten’ Workshop, held in 2006, was designed to examine what we have learned and what we still need to know from a global perspective to develop international standards, guidelines and good practice on the prevention of recruitment of children into the armed forces and on demobilization and social reintegration of child soldiers in Africa. The workshop participants represented over 200 years of collective experience working on child soldiering issues, covering five different continents. The results of the workshop contributed to global learning through formal recommendations and through policy and programmatic responses.